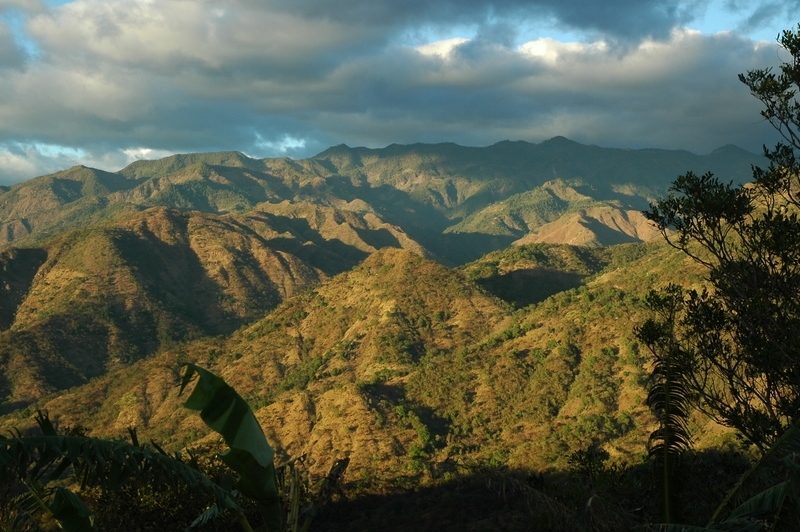 The mountains of Intibuca, Honduras (photo courtesy of Richard Buten). I feel a little guilty for not having regularly posted on the blog in some time. I did post our Thanksgiving adventures, but in fact I was cheating since I wrote that blog for Shoulder to Shoulder. There are multiple reasons for why I haven’t posted so frequently since we began our new job. The most obvious one is that Laura and I are busier in this new position than we have ever been since we came to Honduras. We were relatively busy at Montaña de Luz, but our time off was very secure. The leisure space allowed me to find a routine where I could reflect and write. At Maestro en Casa, the program ran very well. We found things to do to help out — teaching, helping to build the greenhouse, helping with administrative needs and paperwork, etcetera — but again the routine gave us space. Here at Shoulder to Shoulder, things are much different. We find ourselves hopping. Shoulder to Shoulder is an extremely active NGO. They run two major clinics in Concepción (where we are) and Santa Lucia with medical, maternal, nutritional, dental, and preventative care services. Concepción and Santa Lucia are called municipalities, but that is a cultural misnomer by US standards. They are perhaps best described as hamlets where there is a semblance of civilization in a one to two square mile area with six or seven cobblestone streets. Outside that area there is nothing but dirt roads, paths, and mountain passes where the majority of the people live. It is extremely poor, extremely rural, extremely isolated, and above all, an extremely harsh place to live. Shoulder to Shoulder contracts with the Honduran Government to staff and operate almost all of the smaller clinics along the swath of territory known as the Frontera, the Southern section of the department of Intibucá. There are five other “municipalities” and an almost endless amount of remote villages, many of which are only accessible by walking; trucks, motorcycles, and horses can’t get through. Delicias is the most remote village in the municipality of San Marcos. There is no electricity or running water. The clinic there has a nurse, but no doctor. Anyone requiring hospitalization would suffer a five hour journey simply to get to the main road (comically referred to as the highway). Anyone unable to walk would need to be carried in a stretcher, otherwise known as a hammock. Under the best of conditions this trip is treacherous, passing along cliffs with sheer 1000 foot drops on one foot wide eroding ledges. Once reaching the highway, the patient might be lucky enough to get a Shoulder to Shoulder ambulance, but the journey into the real city of La Esperanza is yet another hour and a half over bumpy, jarring roads. 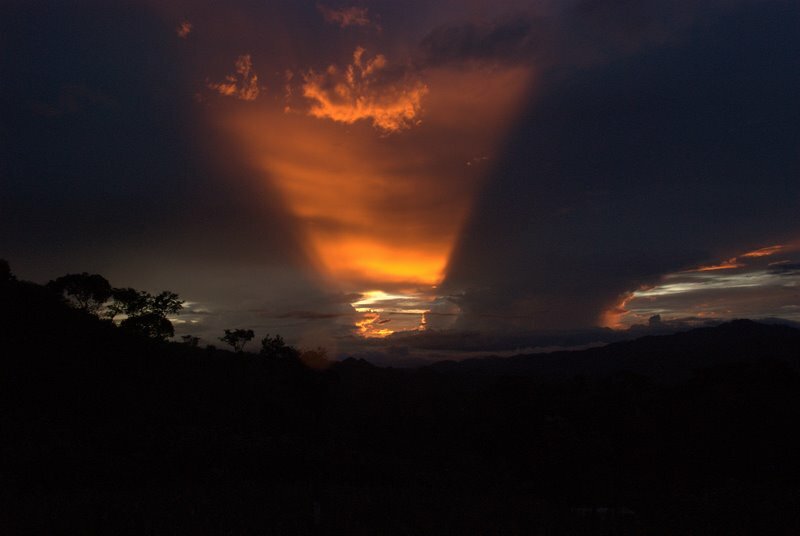 Sunset in Intibuca, Honduras (photo courtesy of Richard Buten). If this was all Shoulder to Shoulder did, it would be most impressive. As it turns out, they do much more. They partner with nine US universities to host medical brigades. They come throughout the year with teams of students, doctors, nurses, interns, and other professionals. They form relationships with Shoulder to Shoulder and the local communities to provide otherwise unavailable services, local empowerment and development. Laura and I have already seen Virginia Commonwealth University, Rochester University, and the University of Wyoming. As impressive as they were, we were even more impressed with a three day brigade offered by the National Autonomous University of Honduras (UNAH) from Tegucigalpa. They are partnering on a long-term basis with Shoulder to Shoulder and the municipality of San Marcos to provide opportunity and development, and empower the citizenry. The brigades form a substantial part of Shoulder to Shoulder’s mission and a great deal of time and effort is expended on them. Still, Shoulder to Shoulder’s work extends beyond the brigades. Primary education in Honduras is a complete disaster. Children in Honduras are only required to go to school through the sixth grade. The good news is that at least this, primary education through six years, is almost universal in Honduras. These schools are plentiful and the children get to them. 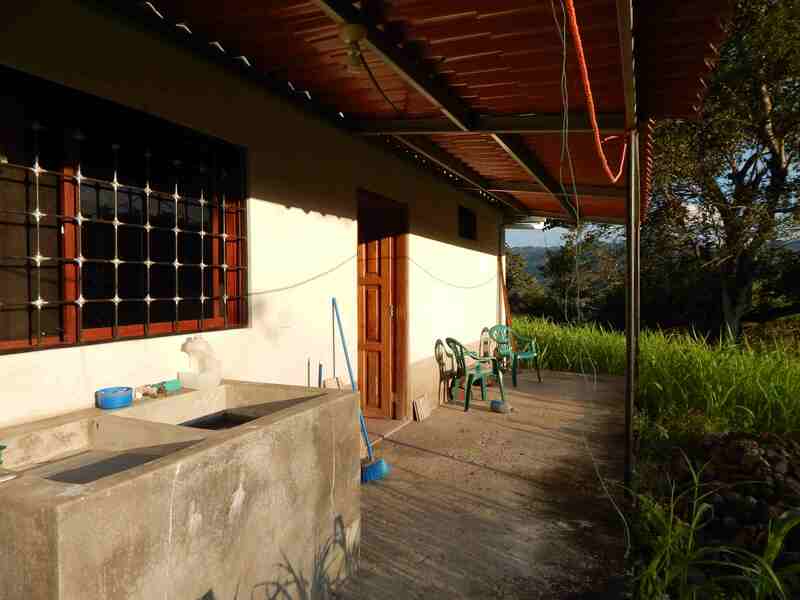 But because resources are so limited in Honduras, the buildings are inadequately small and in serious disrepair, teachers are abysmal in their abilities and knowledge of subject matter, and educational materials are essentially non-existent. Education beyond the sixth grade gets a little better. But there are fewer schools. A two to three year high school track perhaps gets even a little better, but again there are less offered and physically far apart. Education through high school is “free” in Honduras. But after the six grade, the expenses of paying for uniforms, materials, transportation (or accommodations if the child actually has to live in a distant town), and other things makes further education an impossibility for most families. Many kids, in some areas most kids, don’t go beyond the sixth grade. They work on farms, pick coffee, harvest sugar cane, or find a low paying job that will only employ them for a few years until someone younger replaces them. There is nothing wrong with any of these jobs, except that in this socioeconomic system, they keep people desperately poor. Graduating from high school and attending university is perhaps the only way in Honduras to achieve success, at least legally. But even so, because the quality of education is so poor at the foundational, primary level, even supposedly well-educated Hondurans probably don’t realize their potential intellectually or creatively. The one caveat to all of this, however, is that the privileged are unaffected as there are sufficient private schools to meet their children’s educational needs. Front of our house in Concepcion. The educational problems in Honduras are legion. Those problems are greatly exacerbated in the Frontier Region of Intibucá where resources are even scarcer and travel is an almost insurmountable hurdle. But how can a people advance and develop, overcome cycles of extreme and debilitating poverty, without education? I don’t have an answer to that question. Early on in its existence, Shoulder to Shoulder recognized that accessible education needed to be part of its mission. For many years, by developing a committed donor base, they have offered local scholarships to children who want to continue their education beyond the sixth grade, but whose families lack the resources. This program is very successful, even as some sponsored children now attend university. But, primary education had not been part of Shoulder to Shoulder’s mission until three years ago. The community of the Good Shepherd in Cincinnati, OH, partnered with Shoulder to Shoulder to found and build the Good Shepherd Bilingual School in Camasca, Intibucá. The school, now with classes for kindergarten, first, and second grade, is public. It is forming a unique alliance and agreement with the government of Honduras. Qualified, bilingual teachers; a state-of-the-art-building and plans to expand the campus; and abundant, proven educational materials all speak to the excellence of the school. Most importantly, the school is accessible to all children. The parents do what they can to financially support the school and maintain the quality education. Shoulder to Shoulder continues to look for donors and sponsors so the investment will yield a return. The school is considered a model school in Honduras. Laura and I have designed and initiated a child sponsorship program on the web site and hope that it provides the financial backbone for the school. Back of our house in Concepcion. So, Shoulder to Shoulder does a ton of work. Laura and I don’t do any of it. We just watch everybody else, take photographs, and then write about it. We are in charge of communications and development. I have my dream job, writing articles on the web site, expounding upon the various missions and events. We work on the web site. That can be quite a challenge because the internet is very tenuous in this part of the world. That is yet another reason why this blog posting is so late. We do a lot of traveling and visiting. We have gone out to the remote brigade sites, up to Camasca to visit the bilingual school, down along cliff ridges to visit families, and back and forth to La Esperanza on our weekends. Travel is unique here. It is never straight nor flat. We are either climbing or descending along snaked roads and paths. Our destination is often within view, seemingly mere minutes away, but we side windingly inch our way towards it, and minutes become hours. There are large holes that we bump over, and loose rock and soil that we slide through. But we see such incredible things. We are extremely busy and we love it. We have a wonderful house in Concepción. 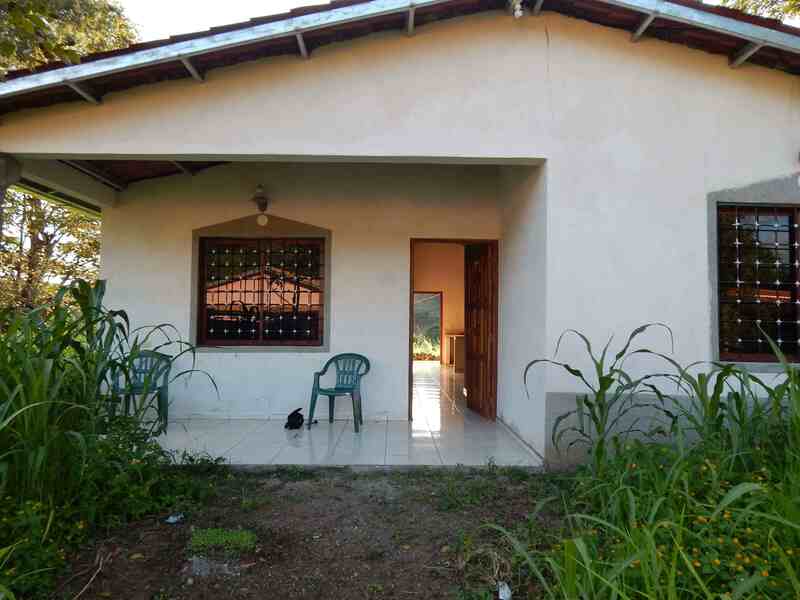 But because there is very little of anything in Concepción, we have kept our house in La Esperanza. We take our weekend time there, enjoying the sensibility of urban life and utilizing the internet we can’t get in Concepción. La Esperanza is urban, Concepción is rural. La Esperanza is cold, Concepción is hot. La Esperanza is rainy and damp, Concepción is cloudless and arid. They are two hours, twenty miles, and 3500 feet in altitude apart from one another, but are so thoroughly distinct. We have the best of two worlds. Check out Shoulder to Shoulder on the web. Laura and I will be in the greater Springfield, MA area from December 21 through January 6 for a small vacation. We hope we have an opportunity to see many of you while we are home. You seem to truly found your place in Honduras! Blessings!